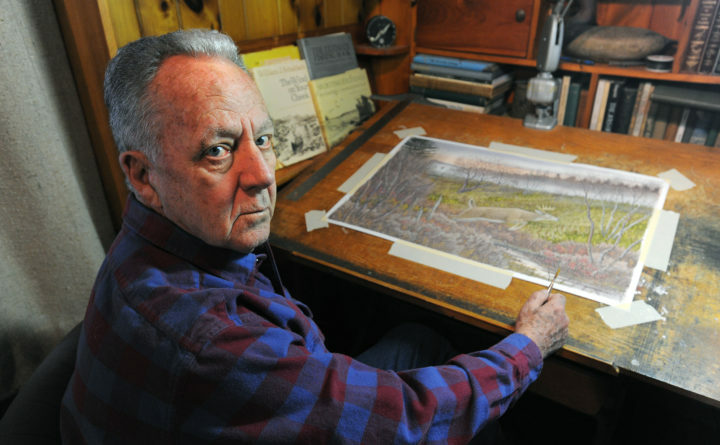 Tom Hennessey of Hampden, a man whose paintings memorialized the traditional Maine outdoor activities that he loved, and who worked as an artist and columnist for Bangor Daily News readers for 54 years, died Friday after a year-long battle with hemochromatosis. He was 81. Hennessey began working at the BDN on Jan. 10, 1959, when he was just 21 years old, and officially retired from the paper on March 1, 1996. Even the most loyal BDN readers didn’t realize that fact, because Hennessey continued to write and contribute artwork to the paper’s pages for another 17 years on a freelance basis. His last regular column appeared in March 2013. He is survived by his wife, Nancy, and three children: Jeffrey Michael Hennessey, Julie Ann Marston and Hope Ellen Hennessey. He was predeceased by an infant daughter, Jill Hennessey, and 12 memorable bird dogs. According to his obituary, at Tom’s request, there will be no services. Hennessey’s work was a testament to timeless values that he held strong, and defended fiercely, depicting the Maine he grew up with, knew well and loved. Hennessey was always interested in art, and when patrons approached him at art show receptions, he told them just that. Hennessey’s work caught the eye of many sporting folk for a simple reason: It reflected timeless outdoor experiences. Hennessey never portrayed his hunters wearing bright-orange clothing, for instance, choosing to paint them wearing green checked coats. Gizmos and gadgets may have invaded the outdoor world, but they never made it into Hennessey’s paintings. 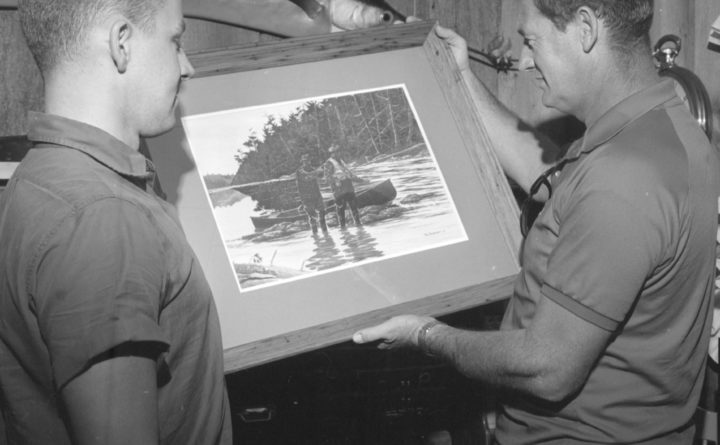 Hennessey was working at the BDN as an apprentice in the composing room, making $37 a week, in the early 1960s when his wife told him about an art exhibition she had seen at the Bangor House. He went and looked at the assembled pieces and decided to submit some of his own. That paved the way to a professional career as an artist, and his friend Dr. Frank Gilley took a couple of paintings to the renowned New York City Crossroads of Sport gallery. In 1964 the gallery director wrote Hennessey and asked for five more watercolors, which he sold for $150 apiece. Hennessey’s art allowed him to travel the world, at one point hopping on a plane every other week to do commissioned pieces around the globe. 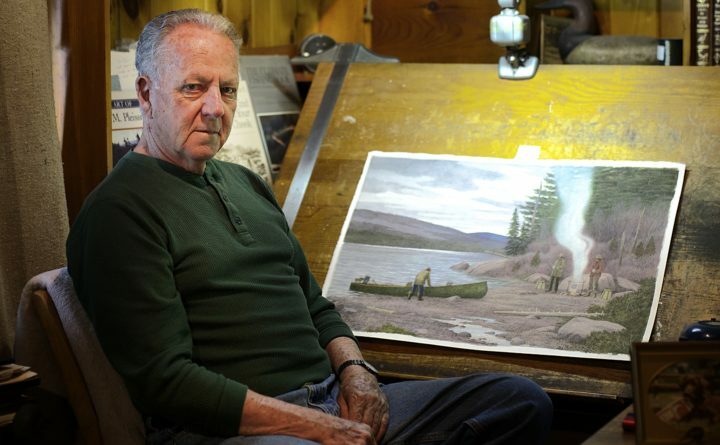 But he admits that he nearly threw his art career away after struggling to properly depict the water in a fishing scene, then throwing his paint and brushes in a trash can. The next day, he took the can to the dump and planned to dispose of them. A strong wind conspired to change his mind. Hennessey looked at that scene, focusing on the water. Then he realized what he needed to do. “I could see what he did,” Hennessey said. Inspired again, he gathered up his discarded paint and brushes and headed back home. Hennessey’s works depict scenes that reflected some of the things he liked best. Hunting with a well-trained bird dog, fishing from a vintage canoe, sharing time with a special hunting buddy. And the art, he said, was the reason for creating. Not the profit. Never the profit. Hennessey finally decided to stop writing for the BDN on a freelance basis after a 54-year career. His final column, which was published on March 1, 2013, explained why. And then he shared a closing thought. “As an outdoors writer it was my privilege and pleasure to be a spokesman for sportsmen; especially when anti-hunting organizations and animal-rights groups attempted to rob sportsmen of their treasured outdoor cultures, traditions and heritage by banning hunting, trapping, even fishing. All of which are integral to fisheries and wildlife management and important to the state’s economy,” he wrote. After that column ran, reader Bob Mercer of Bucksport reached out to explain how important Hennessey’s words had always been.